The 2018 fantasy football season was filled with surprises, both good and bad. As we continue a look back at the campaign, let’s turn our attention to what the biggest surprise was for each of the 16 AFC teams and offer some insight on what to expect from these players in the year ahead. 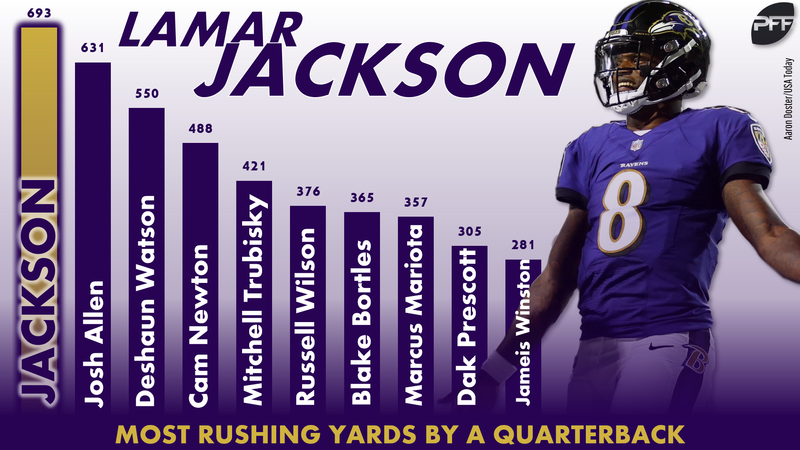 Despite not making his first start until Week 11, Jackson led all quarterbacks with 693 rushing yards on 148 attempts. He eclipsed 70 yards rushing in five of his seven starts. He’s only 22 and the upside is immense, but he’ll need to improve his passing efficiency and cut down on his fumbles (12) if he’s going to take his game to the next level. Allen did most his damage as a runner as well. He has a big arm, but his efficiency throwing the football needs improvement. His 64.7 adjusted completion percentage ranked dead last among all qualifying passers. From Week 12 on, though, no quarterback put up more fantasy points than the Bills’ rookie as he threw for 1,242 yards and eight scores and rushed for another 476 yards on 54 carries. Boyd proved to be the best waiver wire pickup at wide receiver after a hot start in his third pro season. The Bengals’ wideout reached 90 yards or scored in five of seven contests Weeks 2-8. A late-season MCL injury cost him the final two games of the year, but he still finished with 76 catches on 103 targets for 1,028 yards and seven touchdowns. 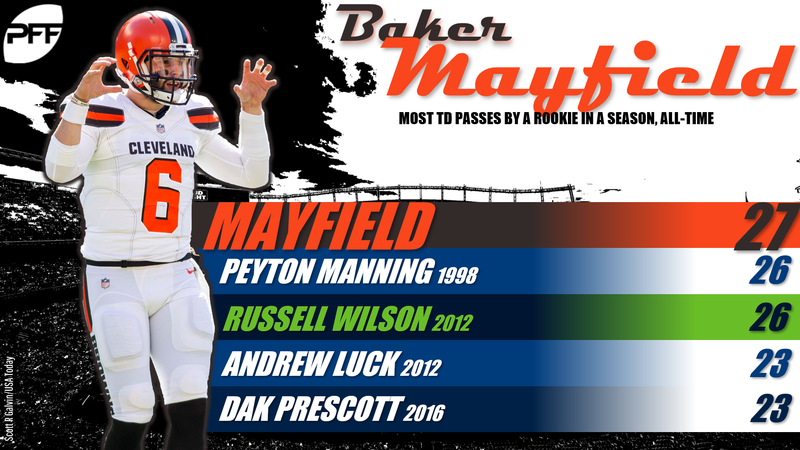 Even though he didn’t see the field until Week 3 and didn’t get his first start until Week 4, Mayfield’s 27 touchdown passes set a new mark for a rookie. His 51.4 completion percentage on deep ball passes ranked fifth-best among all quarterbacks. The Browns are ascending heading into 2019 and Mayfield is at the center of it all. After he beat De’Angelo Henderson out for a roster spot, Lindsay quickly emerged out of a crowded backfield and became one of the few offensive bright spots in Denver. He rushed for 1,037 yards and nine scores while averaging 5.4 yards per carry (third-best in NFL). He also added 35 catches for 241 yards and a TD on 44 targets. After enduring myriad injuries during his college career and suffering a second ACL injury as a rookie, Watson managed to start every game for the Texans in 2018. He even played through a partially collapsed lung that forced him to take the bus to a road game in Jacksonville in October. As a result, Watson delivered on his preseason hype by finishing as QB4 in fantasy. Ebron set career highs across the board during his debut season in Indy, pulling in 66 balls for 750 yards and 13 touchdowns on 108 targets, fourth-most among tight ends. However, a return to health for Jack Doyle could have a large impact on the volume of passes thrown his way. Ebron’s red-zone usage will keep him valuable in 2019. A hamstring injury cost Fournette most of the season and after he came back, he produced a mixed bag of results. Even when he did play his 3.3 yards per carry and 2.35 yards after contact per attempt were a far cry from the 3.8 and 2.47 marks he produced a year ago. 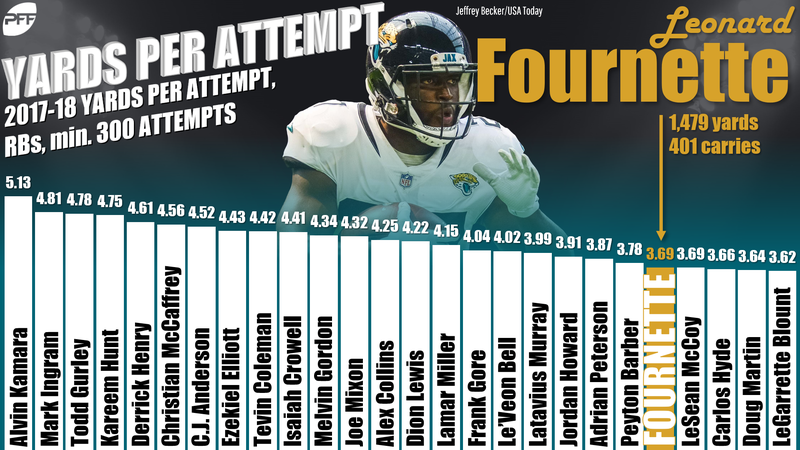 He will come cheap in 2019 and will be in a make-or-break year in Jacksonville. Owners who grabbed Williams off waivers and played in Weeks 15 and 16 likely were able to lock up their fantasy championships. He registered 263 total yards on 23 carries and 13 catches and has kept things rolling in the NFL playoffs. Williams received a contract extension in December, but the Chiefs are likely to address the position further in the offseason. After a disappointing rookie campaign, Williams showed glimpses of what the Chargers expected when they spent such a high pick on him. He led the team with 10 touchdown receptions and finished with 664 yards on 43 catches, but he had two or fewer catches in eight of 16 games. His role grew late in the year and expect that trend to continue next season. Kenyan Drake owners can attest to this coming as a surprise. Gore had 156 carries compared to just 120 for Drake, who did most of his damage catching the ball (53/477/5). The 35-year-old finished with 722 yards and 4.6 yards per carry, but his only TD came on a catch. Despite a late-season foot injury, Gore has indicated he’d like to play a 15th season. The injuries mounted for the Patriots at running back and that opened the door for White. He caught 71 of his 87 targets for 751 yards and rushed 425 yards on 94 carries. His previous career highs on the ground were the 43 attempts for 171 yards he netted in 2017. No running back with more than 40 touches had more than the 1.53 PPR points White produced per touch. Usually rookie tight ends don’t make much of a splash in fantasy, but Herndon defied that as he finished with 502 yards on 39 catches and four touchdowns during his first season. He developed nice chemistry down the stretch with fellow rookie Sam Darnold. Both should continue to take a step forward in the season ahead. 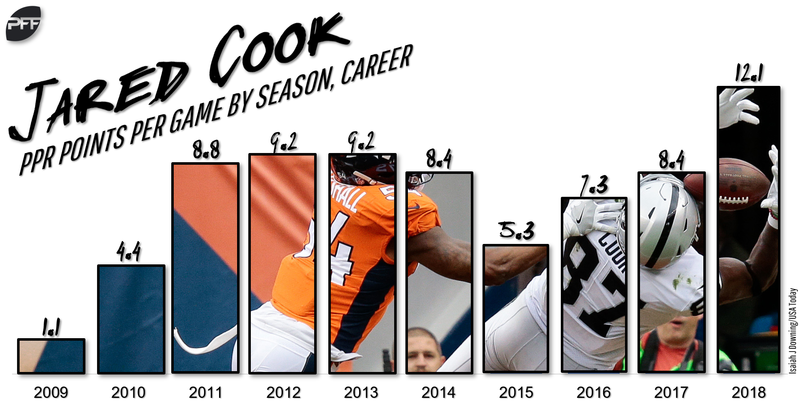 Cook put up career-high marks with 68 receptions for 896 yards and six touchdowns playing in what was mostly a dysfunctional Raiders’ offense. The fact that he did so at 31 was definitely surprising. He is an unrestricted agent entering 2019 and expect there to be some suitors. Given the landscape of the position he should remain a TE1. In one of the more shocking developments of the season, Bell didn’t play a snap for Pittsburgh. In his place James Conner rushed for 973 yards and 12 touchdowns and caught 55 balls for 497 yards and another score. An injury cut Conner’s year short, but he should return as the team’s workhorse in 2019. Bell is demanding big money but should attract multiple suitors in free agency. Mariota failed to take a step forward during his fourth season as he finished with a career-low 11 touchdowns and 2,528 passing yards in 14 games. He only missed two contests but failed to finish many others and was less than 100% most of the year. With yet another play-caller taking over in 2019 and lingering durability concerns Mariota is a weak fantasy option.